SAN LUIS OBISPO — After losing his left hand in a 2004 training accident, Toshiro Carrington returned to active duty just three months later and remained one of the Navy SEAL’s top snipers. But today, when he teaches others his skills, he can’t relate as well with one hand — so he’s asking Cal Poly students to help through the Quality of Life Plus (QL+) lab. The Quality of Life Plus lab, which enlists students to help wounded vets and first responders, began its 10th year this week by issuing a new set of “challenges.” The six challenges propose to help amputee vets who want to cook, surf, ride a bike, walk on the beach and more. Students perform the work as a senior project — yet it’s about more than that, said Jon Monett, a Cal Poly alumnus (Industrial Engineering, ’64) and former CIA employee who founded the lab. 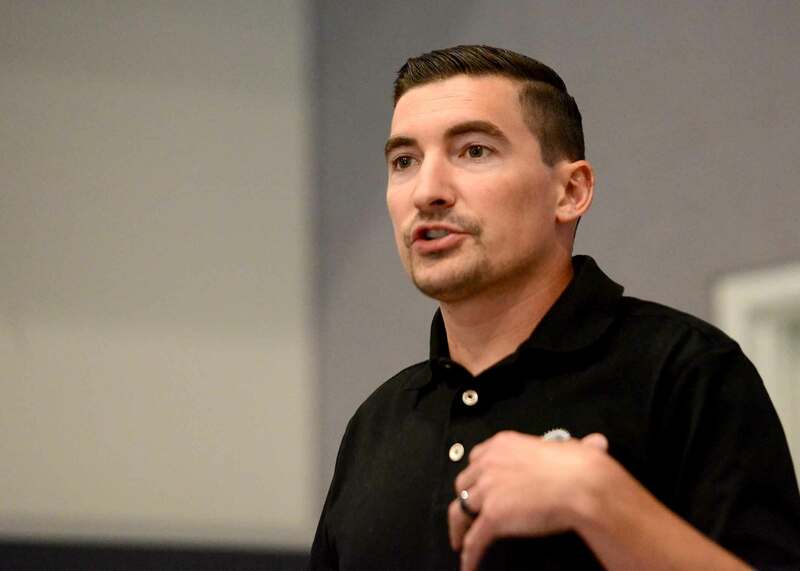 “Once the students meet the challenger, it’s not about the grade — it’s about whether they can be successful in helping someone,” Monett said. Since Monett launched the lab at his alma mater, a dozen others have sprung up across the country. The idea behind the lab, he said, was to help vets while providing students with meaningful experience. From there, students will spend the rest of the academic year working on the challenge. Perhaps the best known challenge was provided by Taylor Morris, a Navy explosive ordinance vet who lost parts of all four limbs to an explosion while serving in Afghanistan. The lab garnered headlines when students created a “quick swap” that Morris could use to change prosthetics on his own. The next year students continued to refine the device while addressing another Morris challenge: cooling the extended limbs, which frequently become very hot. 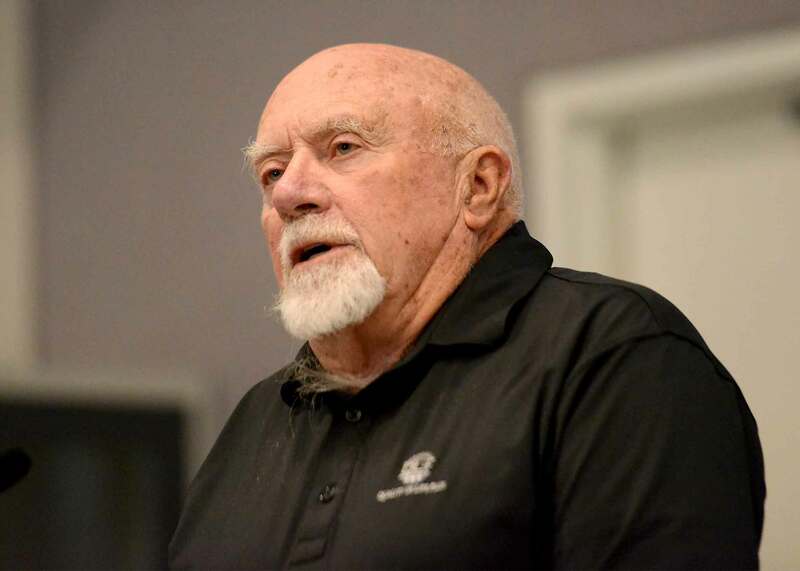 Monett, who managed a quick reaction lab during his career with the CIA, told students they would have to work quickly. — Toshiro Carrington. In combat deployments, he was a team medic, point man, sniper and case officer. But in 2004, after returning from Iraq, he lost his hand in a training accident. He did four more deployments even after his injury, and two tours as a sniper instructor before retiring. Now he is president of Strategic Operations Training in San Diego, where he teaches law enforcement and civilians. — Jorge Segura. As a Marine, he was ambushed in 2010 by a Taliban soldier, whose rifle shot took 45 percent of his right arm. After undergoing 26 surgeries to try to salvage the limb, he had it amputated above the elbow — a decision he considers one of the best he’s ever made. But Segura loves to cook and hopes students will devise a prosthetic that will facilitate his culinary hobby. — Van Curaza. Known for surfing waves over 20 feet, Curaza founded Operation Surf in San Luis Obispo to help wounded vets heal physically and mentally through surf camps. While prosthetics usually help leg amputees stand straight and walk, they do not provide proper balance for surfing, Caraza said in his video. “I have a pretty good idea of what works and what does not work,” he said. He challenged students to design a prosthetic that bends at the knee that will maximize amputee surfing experiences. — Craig Brady. In 2010, the Marine from New Hampshire lost his lower right leg from an improvised explosion device. Brady, who has excelled in sled hockey, loves to walk on the beach with his wife and children. But walking on sand with a prosthetic is difficult — and hurts his back. So he challenged students to devise a “sand foot” that is waterproof, stable on beaches and comfortable. — Taylor Morris. After stepping on an IED while serving in Afghanistan in 2012, Morris lost all or parts of four limbs. The Navy vet, who has had Cal Poly students address previous challenges, has multiple trailers for different purposes. He is seeking a solution for easily changing the hitch for each trailer. — Danny Knutson. The former Navy fighter pilot and avid cyclist was struck by a hit-and-run driver nine years ago, rendering him an incomplete quadriplegic. He challenged students to devise a mounting system that would allow him to get in and out of his recumbent bike independently.